A couple of weeks ago our kitchen island “play-doughing” turned into actual baking (ok- sort of actual baking). My mom had come for a visit a few weeks prior, and while visiting introduced my girls to the delights of one of my childhood favorites…monkey bread. Oh my. The whole experience left quite an impression on the three-year old. Don't worry, there was no mixing of media. Well, on this particular grey play-dough day, we were scheduled to attend a potluck style baby shower. We still had all of the few, (and I mean few), simple ingredients to make this monster, so monkey bread was the obvious choice. The big sister was delighted and didn’t even seem to mind pushing aside her” baby-sister’s-naptime-playdough-creation” to bake something real. If there is a pre-schooler or perhaps even toddler in your life, this is a great recipe to bake (I use the term loosely), because it is fun and easy for little hands to make, fun and easy for little hands to eat, and involves very little mess or clean up. There aren’t even any mixing bowls involved. Seriously! And there is popping and shaking! 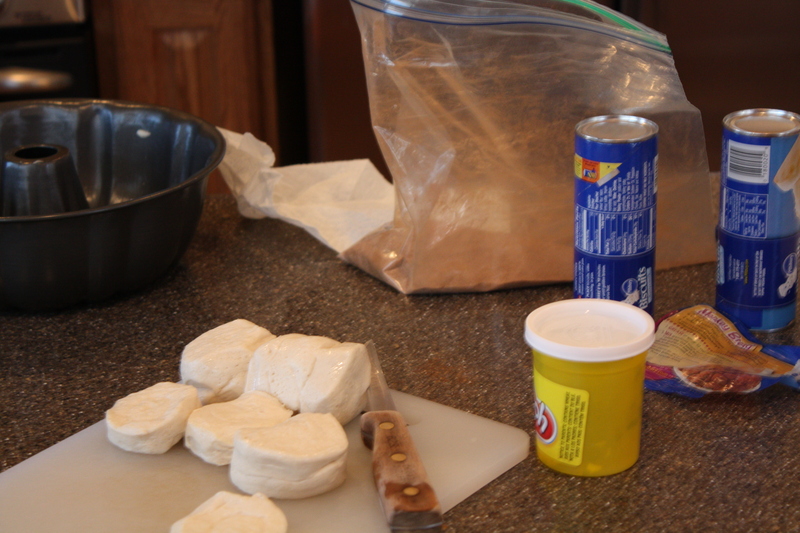 You basically cut up pieces of already made popping-can buttermilk biscuits, drop them in a freezer bag with cinnamon and sugar and shake ’em. (Add your favorite “shaking” song and dance moves for really genuine three-year old giggles. I happen to have a few in my repertoire. The originals probably weren’t appropriate for her little ears, but the cleaned up mommy versions seemed to do the trick). Next you dump the cinnamon and sugar coated pieces into a bundt pan, drown them in a heavenly brown sugar-melted butter mixture and throw it in the oven. That’s it. I think it goes without saying that this stuff has virtually no redeeming nutritional value. But it is decadently delicious. Buttermilk biscuits, brown sugar, butter. Some seriously tasty b- words. Sadly, the event we were supposed to attend was cancelled, and after lunch our family was forced to enjoy some of this stuff still warm from the oven. 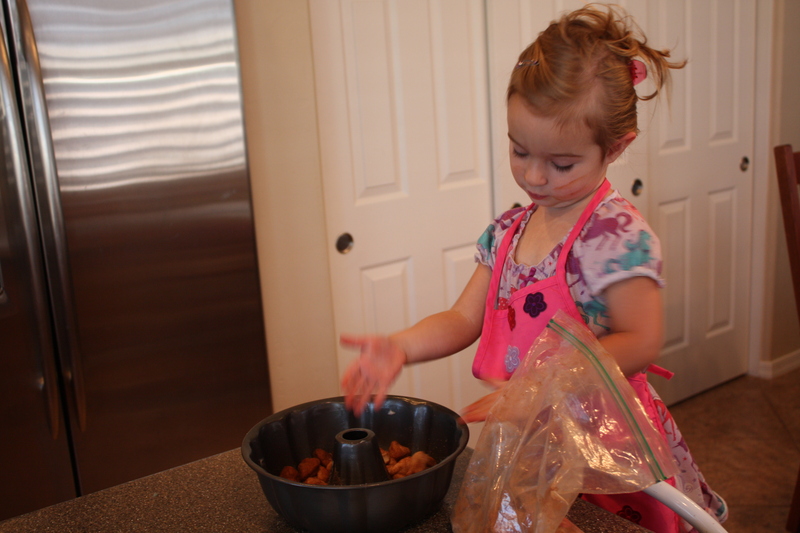 Have you made or enjoyed monkey bread? Got any interesting variations? 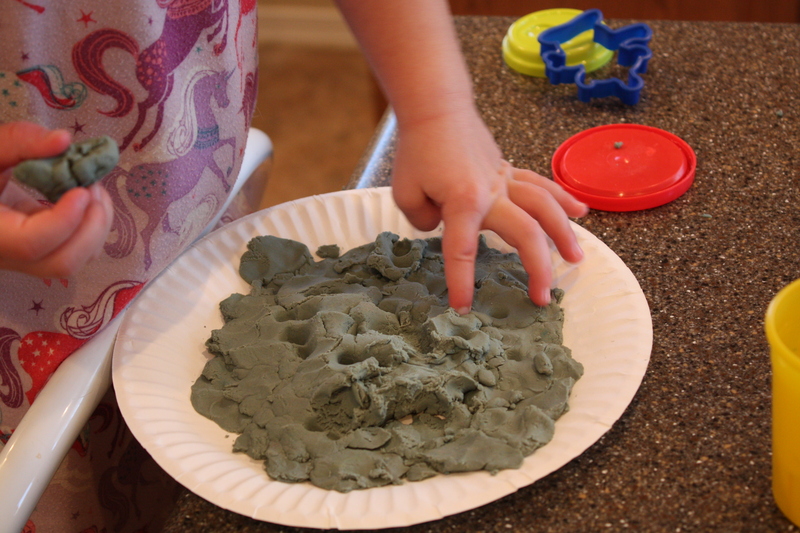 Is all your play dough gray? 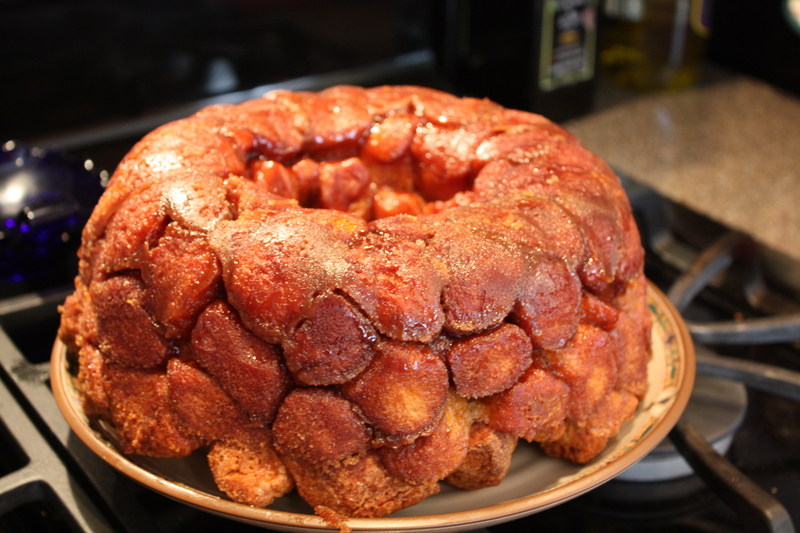 I make a similar version of Monkey Bread, but it includes a package of butterscotch instant pudding powder. 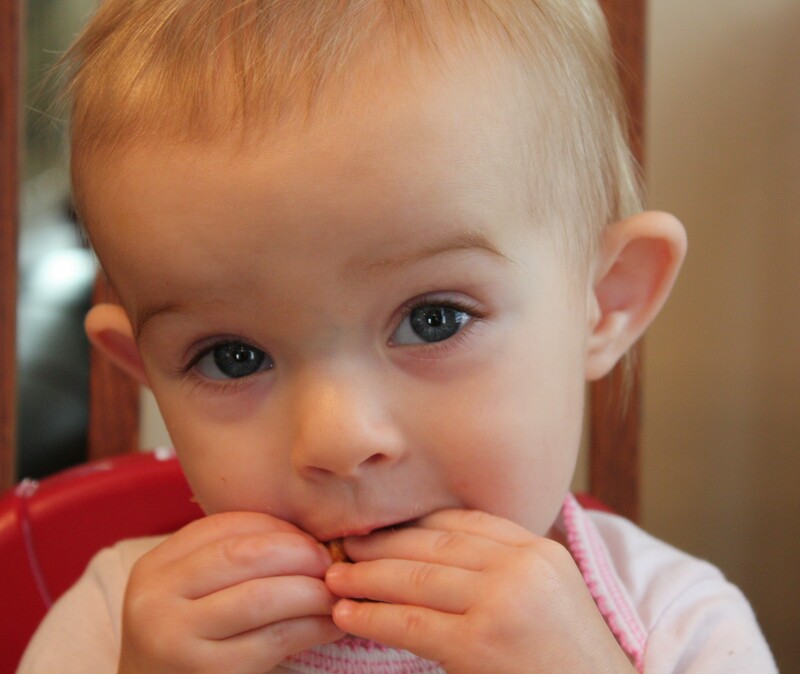 Butterscotch = another seriously tasty B word! Yum! we’ll have to try that next time. Looks like a very fun day and VERY cute pictures..